Calculates tide heights based on tide station harmonics. It includes the harmonics data for 637 US stations. The harmonics data was converted from < https://github.com/poissonconsulting/rtide/blob/master/data-raw/harmonics-dwf-20151227-free.tar.bz2>, NOAA web site data processed by David Flater for 'XTide'. The code to calculate tide heights from the harmonics is based on 'XTide'. 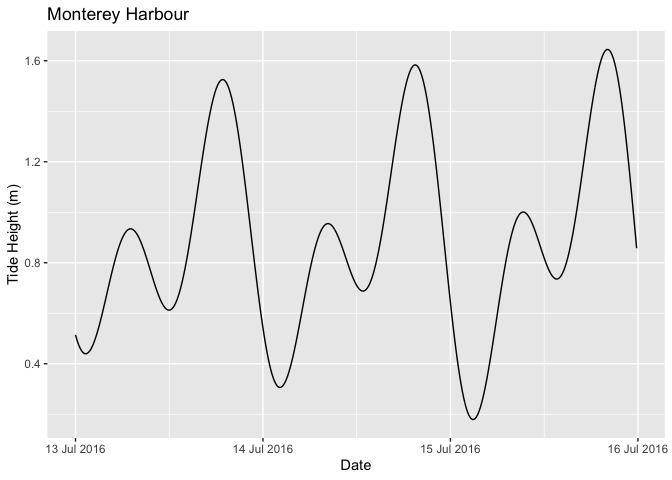 rtide is an R package to calculate tide heights based on tide station harmonics. It includes the harmonics data for 637 US stations. Tide heights can be also obtained using rtide through a shiny interface developed by Seb Dalgarno. Heights. R package version 0.0.5. Pull requests are always welcome. The harmonics data was converted from harmonics-dwf-20151227-free, NOAA web site data processed by David Flater for XTide. The code to calculate tide heights from the harmonics is based on XTide.